The new CD, Post, is now available. Get yours at CD Baby (CDs & MP3s). Now on iTunes! 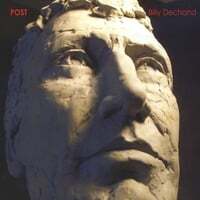 Behold Billy Dechand's sixth CD, Post. Three years in the making, it features a wide variety of Saint Louis local musicians. Feel and witness its many forms of unfettered indie pop. The first half of the album is its heart, demonstrating Billy's song writing skills -- crafted hooks and aching beauty. The first words sung, "Clouds are real", set the tone. That's on "Blew To Me", exuding some sort of real-world mysticism. There is a strong dose of chamber pop ("I'll Hold You Up" and "It Never Rains On My Birthday") growing with percussion, clarinet, violin, and layered harmonies. Post is a more introverted album, mostly recorded at home. Curiously, several songs have grand orchestrations that somehow maintain that intimacy. "Stay", an elegant gem collaboration with Leslie Sanazaro, will break your heart. Billy's singing is both sweet and wild, singing both of loss and indignation. The quirky rocker "Post Post Modern Man" barks out the feelings of a man out of time. Written several years ago about then-current events, it seems to stay strangely au courant. "That is one heck of a gain, one whale of an oil stain." There's a fair amount of his old humor and charm as well. Saint Louis's one-and-only Celia lends her own unique joy to the odd ode to love, "Guys Like Girls". On "side two", the mind-side of Post, Billy explores the weirder areas of indie pop. "So True, So What" is an angular song of spite and feedback, while "Half-Assed" is a self-referencial meta-song professing little more than "Half-assed is better than nothing at all." This second half is clearly more irreverent, until the end, when he returns to simple beauty in "Green And Blue And White", a simple celebration of nature. Post took a long time to create, and it may provide as much time in enjoying its home-spun uniqueness.